You may not think of sound absorbing panels when you contemplate going out to eat or for cocktails with friends. An outdoor garden with a wall may not be your idea of a fun atmosphere, but what if it is incorporated beautifully. 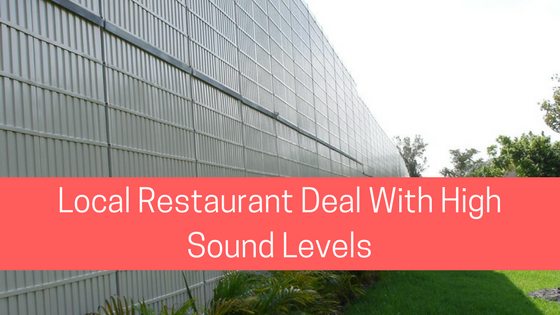 For instance, a pizza restaurant owner contacted us about building a wall that would help ease the neighbor’s concerns about loud music and talking during the summer months when customers wanted to frequently spend time dining in an outdoor garden. The client wanted to build a wall that would allow them to create a larger dining space, but the bigger challenge was finding a way to make it appealing to diners and the public on the other side. We impressed our pizza client by showing up to the zoning hearings with technical information that showed exactly how we proposed to build a sound absorbing wall that would protect the environment, create a quiet space for customers, and fulfill zoning requirements and regulations. By working as a team, we consulted with the client on several occasions to help them understand the scope of the project, how we customize our sound walls, and for zoning approval. Our goal is to design a solution to sound level abatement for any industry, business, location, and problem set. The community was very nervous about adding a wall to the garden, but at the same time, they wanted a nice space to have some family time on warm, summer nights. We proposed a three-sided wall with sound absorbing materials. Our reason was twofold because competing sounds from other restaurants and outdoor venues in the area contributed to the overall decibel level in the garden area. We also needed to minimize the sound from the pizzeria, especially later in the evening when residents are going to bed early for work or school the following day. Besides maintaining sound levels, the client needed access for a fire escape and patrons. Finally, an appealing design was extremely important to building the brand for the client with a space that allows them to accommodate more diners and invite repeat business. Our ivy screens improve the project over time adding more appeal and charm as the garden grows and ages. Because the pizzeria is in a place with other restaurants serving outdoor customers, the zoning committee required a permit that shows how the restaurant planned to tackle late night noise, music, and conversation levels. Our sound walls reduce decibel levels by as much as 25 percent. The additional ivy screens will add more sound dampening capabilities over time allowing the pizzeria to block out nearby sound pollution. Because our wall absorbs the sound instead of reflecting it, the client never has to worry about being offensive to the neighboring homes. By using the wall, the pizza parlor creates a better dining experience and becomes a good steward of the community. The improvements help get more people in the door to enjoy pizza and spend time in the new garden. Our walls are easy to assemble with a tongue and groove construction. They are often placed in a day. Sometimes, we can install a tailored solution in a few hours. Our crews can come and install the wall, or we can send you detailed blueprints to help your crew get the engineered panels in place quickly. Because there are many color and texture options, we can create stunning and effective solutions for any business from oil drilling operations to schools, airports, large residential centers, and concert venues. Did you know that even the national parks are not immune to sound pollutants*? Whether the offending problem comes from an overhead jet, loud exhausts, the low hum of compressors, high pitched engines, or construction equipment, sound pollution comes in many forms. It seems like everywhere we turn, there is always something piercing the peace and quiet. Since our sound walls are created to eliminate noise rather than reflect it, we offer clients a better solution to traditional concrete walls. Our barriers are lightweight and appealing. There is no need for a thick wall that is immovable. We can configure a project after installation because our products are modular. Whether you want a wall that looks like brick or stone, we can create a product that will meet zoning requirements and be beautiful add luxurious details at the same time. In our restaurant project, our sound barriers wall helped a pizzeria create a lovely dining space with a wall that continues to get better over time. Ivy installed at the base will continue to grow and expand across the added screens giving the space a living wall to dampen the sound and create a stunning backdrop for customers to enjoy. No matter what size wall or screen a client needs, we can create a tailored solution that reduces sound pollution levels, helps meet zoning and sound regulations, appeals to the public, and improves the company. We also help protect the natural habitat for local species that live in the area. By eliminating offending sounds, we can ensure that animals can communicate during migration, find each other in the mating season, and protect offspring from intruders. By thinking forward, we create a sound absorbing treatment that improves the business while serving the needs of the community and protecting residents and local wildlife from offensive sound levels. When you need to get rid of loud noise or stick to a low decibel level, let us assist you from start to finish. Whether you need us to show up to zoning meetings with detailed blueprints, or you want someone to explain the project to locals, we can help. Our designs are created as unique solutions that fit all your needs from appearances to technical noise reduction specifications. Find out more with a free estimate today or check out our blog.